After winning seven straight elections and two referendums since 2002, few expect Turkey's Islamist Justice and Development Party (AKP) to do badly this time around. Almost every assessment of the national parliamentary election to take place in Turkey on June 7 rates it among the most important in the republic's nearly century old history. The New York Times deems it "crucial" and the London Daily Telegraph "pivotal." Huffington Post calls it "the biggest election" in the republic's history. The Financial Times declares that "Turkey's future is at stake." The focus is not the usual one on "Who will form the next government?" Analysts agree that the Justice and Development Party (Adalet ve Kalkınma Partisi, or AKP), in power since 2002, will win again. But will it have to sign up a junior partner? Will it win sufficient seats to change the constitution and fulfill President Recep Tayyip Erdoğan's plan to turn his position from a largely symbolic one into a fully executive position? Erdoğan compares the expanded powers he seeks to those wielded by absolute Saudi monarchs. The main drama concerns a new party, the leftist, Kurdish-oriented Peoples' Democratic Party (Halkların Demokratik Partisi, or HDP): Will it manage to reach the world's highest threshold of 10 percent of the total vote and enter parliament, in this, its first national campaign? If yes, it could deprive the AKP of its majority 276 seats; if no, the AKP will likely reach that number and maybe even the magic 330. 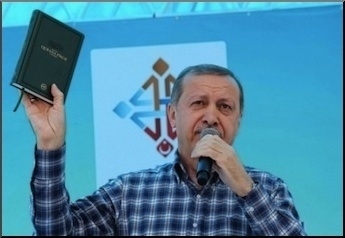 President Erdoğan stumping for votes with a Koran in hand. Erdoğan behaves as if his wished-for constitutional changes have already been effected. Being a brilliant domestic operator and also an egomaniac in a tinderbox of a region suggests where Erdoğan's future troubles lie – abroad. Under his leadership, Ankara suffers poor to terrible relations at present with nearly the entire neighborhood, including Moscow, Tehran, Baghdad, Damascus, Jerusalem, Cairo, Athens, the Republic of Cyprus, and even with the new leader of Turkish Cyprus. 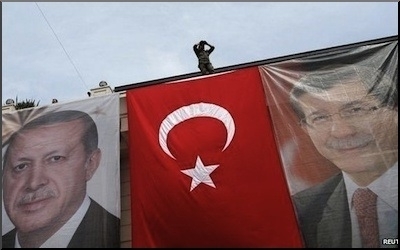 A major foreign policy blunder will likely bring the Erdoğan era to an inglorious demise. Some foreign policy blunder on Erdoğan's part, perhaps with Russia (in Ukraine) or Israel (in Gaza), perhaps in the killing fields of Syria or the gas fields of Cyprus, will likely bring the Erdoğan era to its shuddering and inglorious demise. And when that moment arrives, hardly a soul will bring up the results of the June 7 election; and none will remember it as a turning point. Still, even an unimportant election matters: I invite readers to join me in the unwonted experience of rooting for a left-wing party, the HDP, to gain 10 percent of the vote, to win parliamentary representation, and then, one hopes, cleverly to obstruct Erdoğan's power grab in what small ways it can.